Islamic terrorism is obviously a clear and present danger to safety and freedom in America, but there is an even more serious threat facing the Republic. Those involved in the destruction of a free republic have been infiltrating strategic posts in American bureaucracies in both federal and state governments for more than a hundred years. Today many federal and state governments behave more like oligarchies - than representatives of the people. In Washington DC we have only one branch of government left. That is - the judicial branch, who now makes’ AND enforces their own far left ideology with impunity. Totally and blatantly ignoring the law that they took an oath to uphold…the U.S. Constitution. Now the Courts no longer just fulfill, and carry out the law, they illegally make and enforce their own law. As much of America undergoes a conservative awakening of sorts, the left is radicalizing at a rapid and dangerous pace. They have formed a shadow behind the scenes government now known as the DeepState. In the wake of Donald Trump’s election, which was, in many ways a catalyst for the political polarization we see on the left, the entire state of California, one of the most un-American states in the union began to yammer on about possibly seceding from the Union. You and I know the result of the last true threat of state secession, it started the Civil war. This temper tantrum became the prototype for the “resistance” movement, who patently oppose President Donald Trump on every possible subject, in every possible way, for no reason other than he’s not criminal Hillary Clinton who is one of the leaders of the DeepState. 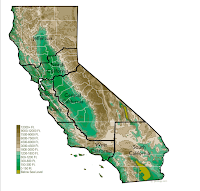 Now, a different kind of California secession movement has spawned itself, this time with the rural parts of current California hoping to separate themselves from the urban population centers that dominate the state’s cultural and political trade. With the reading of their own version of a Declaration of Independence, founders of the state of New California took the first steps to what they hope will eventually lead to statehood. CBS Sacramento reports they don’t want to leave the United States, they just want to leave California. “Well, it’s been ungovernable for a long time. The highest taxes in the country, indoctrination type education, you name it, and we’re rated around 48th to 50th from a business climate and standpoint in California,” said founder Robert Paul Preston. 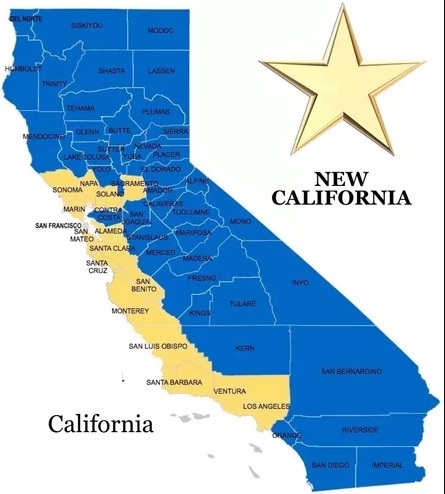 The state of New California shown in blue at right, would be a two state solution incorporating most of the state’s rural counties, leaving the urban coastal counties to the current Social Democratic state of California. But unlike other separation movements in the past, the state of New California wants to do things according to the Constitution, citing Article 4, Section 3 of the U.S. Constitution and working with the state legislature to get it done, similar to the way West Virginia and other states were formed. The Law says: “New States may be admitted by the Congress into this Union; but no new States shall be formed or erected within the Jurisdiction of any other State; nor any State be formed by the Junction of two or more States, or parts of States, without the Consent of the Legislatures of the States concerned as well as of the Congress...” So the U.S. Constitution allows for this with consent of the Federal and state legislatures. City’s enormous and overwhelmingly Social Democrat liberal population completely controls the state’s political scene, even though the remaining counties in the state are extremely conservative. Then there is the California proposal of a 6 state solution shown at right. This has similarities to the New California proposal, in that it isolates the coastal regions. Should the day ever come where we have to choose which California to visit, I know right where I’ll go. And that is to the northern state of Jefferson. Which brings yet another proposal, it’s not a new proposal. It’s actually been going on since early 1900, and that is another two state solution. 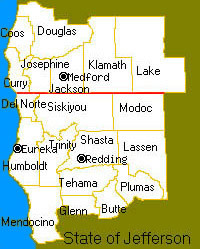 The state of Jefferson in the North and the state of California in the South. You can get a glimpse of that shown at right. As you can see it also includes the southern part of Oregon. As much as one might like to break California up into six states, it seems highly unlikely to me. Too many people, and too many counties involved. But having northern or the central and southern coast of California secede from the rest of the state seems to me to be a more plausible solution. Moreover, it will still leave the rest of the state to continue to secede from Southern California or the coastal counties. The populous of the Central and Southern coast of California have an attitude that – ‘I’ve got mine…to Hell with the rest of you!’ This is a typical elitist’s attitude leading to despotism my friend. Do you realize that there are 9 State legislators representing Northern California and 111 representing central and Southern California? Just a tad out of balance wouldn’t you say! Is this the balance of power that the Framers envisioned? I don’t think so. This is how the Hollywood elitists control the state with their fantasy utopian political ideology. If the Federal government becomes an oligarchy’, and it will, if we continue down this dark road to the DeepState, I might be in favor of states seceding from the United States, but until that time, if a free people are to remain free they must take control of their own states. Once the states are repatriated then we might have the where with all to return this nation back into the American Constitutional Republic. Did you know, that under the law we are guaranteed a Republican form of Government not a Democracy? Article 4 section 4 of the U.S. Constitution: “The United States shall guarantee to every State in this Union a Republican Form of Government, and shall protect each of them against Invasion; and on Application of the Legislature, or of the Executive (when the Legislature cannot be convened) against domestic Violence”. …and shall protect each of them against Invasion. You will notice that it doesn’t say ‘on Application of the judicial branch of Government. ‘The courts have done nothing but usurp the authority of the legislature and the Executive branch creating Judicial Tyranny. What we have evolved into in America, is Social democracy. It originated as a political ideology that advocated an evolutionary, surreptitious and peaceful transition from capitalism to socialism using established political processes in contrast to the revolutionary approach to transition associated with orthodox Marxism. THE BOTTOM LINE: One thing you can do right now is to write your federal representatives here, (they can’t represent you unless they hear from you) and kindly tell them to grow a spine and take back control of law making. Legislators, and legislatures alone, have the constitutional power to make law, not the Courts. We have been witnessing judicial tyranny my friend. It’s time to put a stop to this before it’s too late and we have to resort to the last’ resort - violence. So whether you want a two state, a six state or a no state solution to the tyranny of the social oligarchy I do hope that you consider just what it means to be a free American. It surely isn’t more anti-Constitutional laws…I know that much!